SURREY auction house, Ewbank’s, reporting great results from its Spring modern British art sale in April, is already expecting widespread interest in its next sale of fine pictures and antiques, taking place on June 21. The catalogue includes a painting by British artist Benjamin Evans Ward of a full-length society portrait of a seated lady, whose identity is a mystery but is believed to have been Jennie Churchill, mother of Sir Winston Churchill. 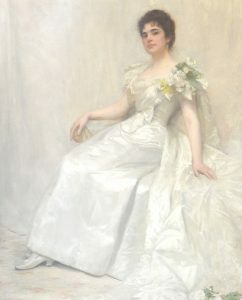 The work by Evans (1857-1933), who moved to and worked in the USA, is already catalogued for sale. Family tradition gives the attribution to the sitter and the portrait bears a striking resemblance to other portraits of Jennie Churchill (née Jeanette Jerome, and later Lady Randolph Churchill), although there is no proof of her identity.